When I publish scripts that use SDK properties or methods, one of the questions that comes back regularly is “Where do you find what to use ?“. Let me assure you, there are no tricks, optical illusions or black magic involved. I’m simply using the numerous resources that are made available in the VMware Developer community. Diving into the SDK is like making a big trip, you have to start prepared ! Start of by getting your hands on the vSphere Web Services SDK package. a bit like Google Maps but then for vSphere. It allows you to find your way around and zoom in all the way to “street level” view ! Just double-click on the index.html file and you have access to the complete Reference in your browser. No Internet connection required ! 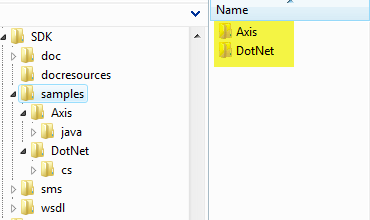 As I already remarked in PowerCLI and the SDK – Part 1 no PowerShell examples yet 🙁 But hey, we’re patient and let the fairies do their work 😉 And there is a lot to be learned by looking at the Java and .Net examples. the WSDL (Web Services Description Language) files for API 2.0 and API 2.5 (which also covers API 4.0). New since vSphere and (as always) still experimental. 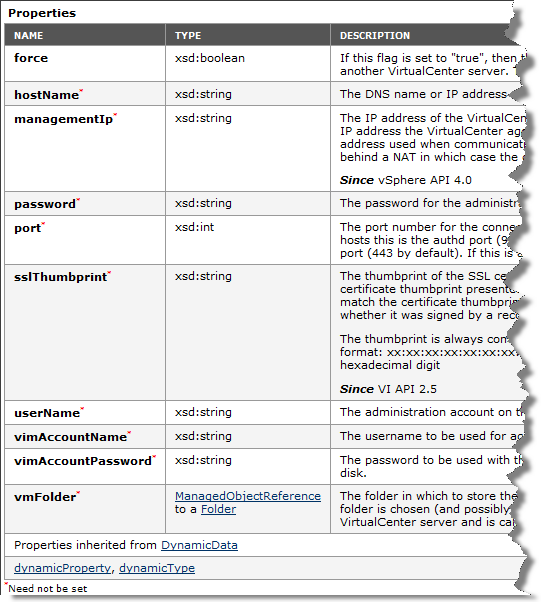 From the ReadMe page: “…simplified access to all vCenter storage information associated with VMware vCenter servers.“. These APIs are for querying only, no changes can be done through this interface. 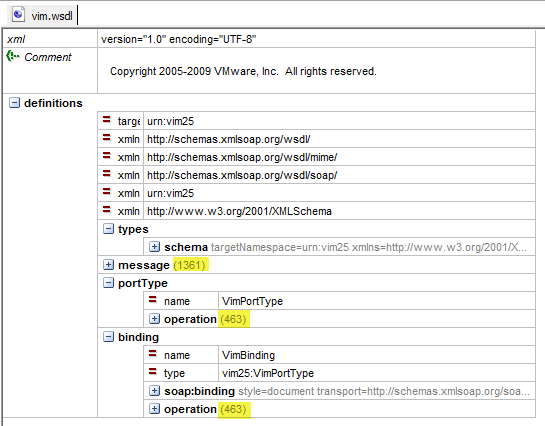 While the intended use of the VMware vSphere API Reference Documentation is probably obvious, that of the WSDL files is perhaps less so. In the W3C definition of a WSDL file it says XML, so I prefer to use XMLPad (see also My PS toolbelt) and it’s Table View. 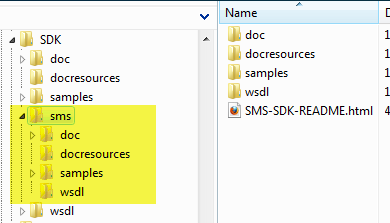 When we open the bigger of the two WSDL files we see a wealth of information about the SDK. Did you know for example, that there are 463 methods you can call via the API ? And did you know that there are 1361 messages/faults these methods can return ? We can do lots of useful stuff with this file. As an example let’s take the AddHost_Task method. From the above diagram we can see that this method requires a vim25.AddHostRequestType object to be passed. Looking up this vim25.AddHostRequestType we can see which are the parameters that need to be provided to the method. 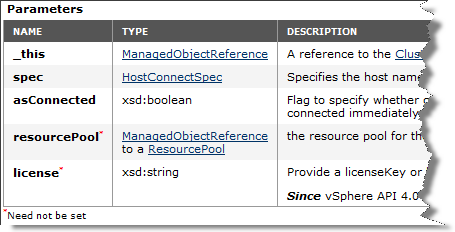 The parameters are all “standard” types (boolean, string, MoRef) except for the spec parameter which is of the HostConnectSpec type. We look up this “complex” type and see all it’s elements. Note that the entry also shows which elements are “optional“. These are the ones that have a zero value in the MinOccurs column. Now all this information is also available in the API Reference as the following screenshots confirm. Also if a parameter is optional or not (see the red asterisk after a property). 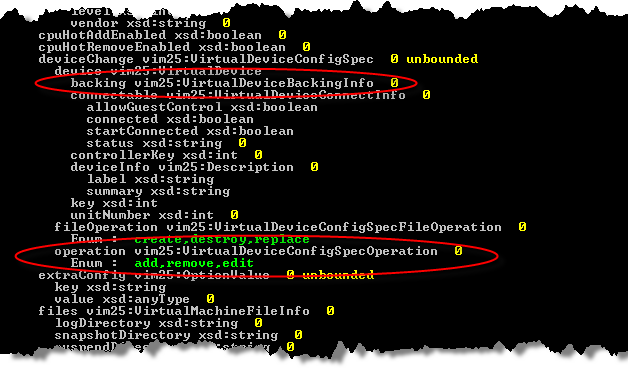 … and the HostConnectSpec object. $wsdlFile = $wsdlRoot + "\vim25\vim.wsdl"
Line 39-138: these lines create the hash tables with the required WSDL information. This is a rather simple method (looking at the parameters at least). The yellow numbers behind a property indicate what the minimum (and maximum) occurrence of the property may be. In this case we see for example that the port property may be left out. 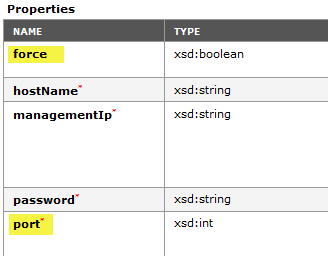 This is what is indicated in the SDK Reference by the red asterisk behind a property. When there is no number behind the property, a value for that property has to be provided to the method. One such example is the force property. This produced, as you could have guessed, a rather long list. That’s why I will only show some extracts. With this method there are two noteworthy points. the backing property (2nd extract) has no further child-properties. That’s because, depending on the device you are manipulating, you will have overlay this property with a more specific object. 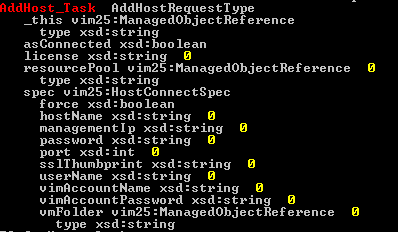 All in all, this script was a personal exercise in getting to know WSDL files. As far as I could see there are no PS scripts/modules that allow you to extract this kind of information from a WSDL file. 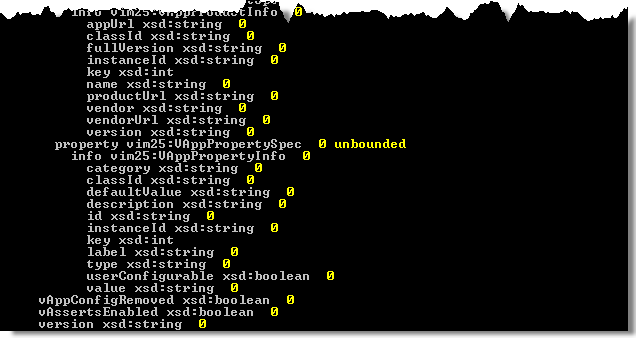 The script also allows you to see all the properties for a method in one list. It avoids clicking through all the hyperlinks in the Reference Guide ;-). In conclusion, you now have your maps (and even some very detailed plans with the script) to start your wonderful trip through SDK land. More on the actual start of the trip in a next episode in this series. Thanks Eric. Glad you liked it. As some of you might have noticed there is an issue with the way the script displays the ManagedObjectReference. I’m looking into this “feature”.